This month, we spoke to two of our landlords, Ian & Nunzia about being a landlord, the challenges that come with it and what it means to work in partnership with Abode. The pair have been in the business for 25 years and own let out 10 properties. When not engrossed in their properties, Ian enjoys business, investing, being a mentor to others, learning to fly helicopters, Nunzia enjoys yoga, pottery, reading, personal growth and travel. Both Ian & Nunzia also enjoy being dedicated parents and trying to be there for their children as much as possible. How Did You First Become a Landlord? As a 21 year old student in Bristol I was living in a block of flats and one of the owners was looking to sell. I realised that the rental income would pay for the mortgage, all related expenses and leave a few hundred pounds a month profit left over. I happened to be on a placement year, so I went to the bank and asked for a mortgage, all they wanted to see was 3 months of payslips which I could provide and with the help of a deposit from my father it was all quite straightforward, nothing like the process you have to go through today! What Makes a Perfect Tenant? Somebody who pays the rent on time, keeps the property clean and causes no damage, uses and cares for all the appliances appropriately and informs the landlord immediately of any issues. One of Ian & Nunzia's properties - what a view! If You Could, Which Celebrity Would You Love to Have as a Tenant? None, as I am sure that they would be very demanding. How Long Have You Worked With Abode and What Service Do You Use? We've been working with Abode since they bought the Estate Agency that we were working with. We currently use the Lettings only service but intend to use the fully managed service for all within the next 12 months. What Do You Value Most About the Service You Receive From Abode? Due to the quality of some of our properties, we have been very impressed with Abode’s ablility to find good quality tenants (businesses or invdividuals) who are willing to pay high rents. 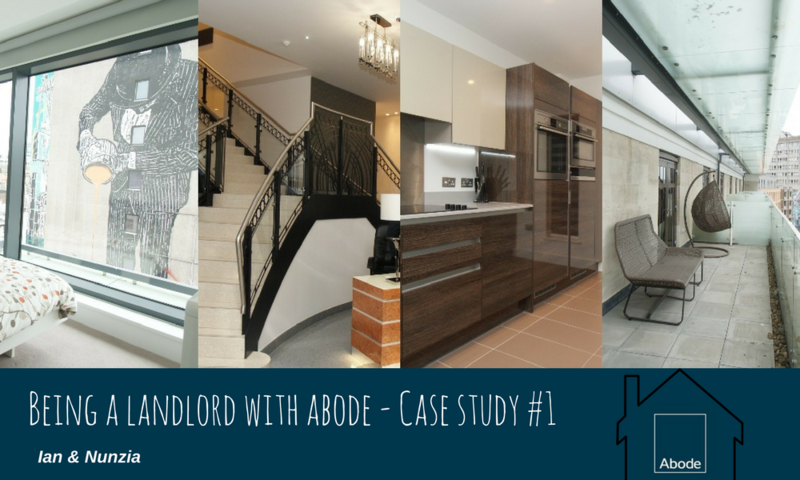 Even more impressive is the fact that most of the tenants have been found with just one visit, Abode really know how to match a tenant’s requirements with a property and this ensures we have very little down time. How Do You Stay On Top of Changing Legislation? The Abode Newsletter is a very helpful source. Any Advice For Those Considering Purchasing Their First Property To Let? It is currently a challenging time trying to buy a property which will provide a reasonable return. Given the uncertainty caused by Brexit, the market softened in the second half of 2017 so perhaps waiting a bit more to buy at a lower price would be wise. Regardless, whenever and whatever you buy, we would recommend buying in the best location possible that your budget can afford. Don’t just go by the numbers, the yield might be wonderful but if the property isn’t in the best location it won’t attract the best tenants. You also need to remember that at some point you will want to sell the property, the best locations sell the fastest, they keep their residual values more when prices go down and increase the most when prices go up. We have a rule that if we can’t envisage living in the property then we won’t buy it. At Abode, we understand all landlords have different needs when it comes to managing their properties; that's why we offer different levels of service to suit you - from viewings only to full management. To find out more about the services we offer for landlords, call us today on 0117 973 8866 or email info@yourabode.co.uk.